We started watching Let's Fight Ghost. 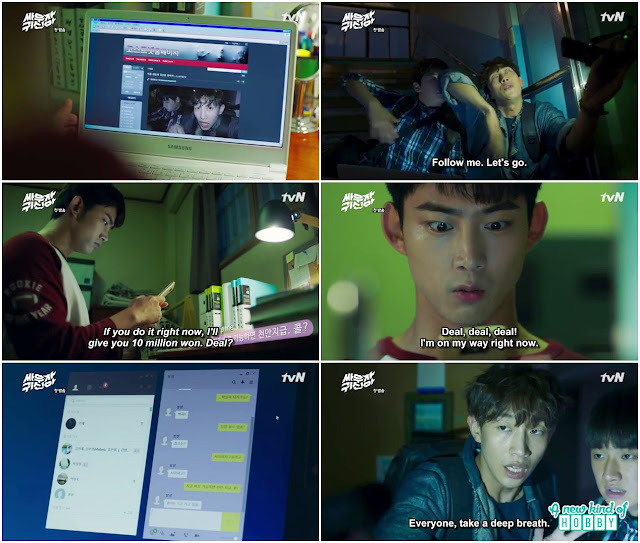 We though it would be an scary drama But it was more funny rather then being scary. 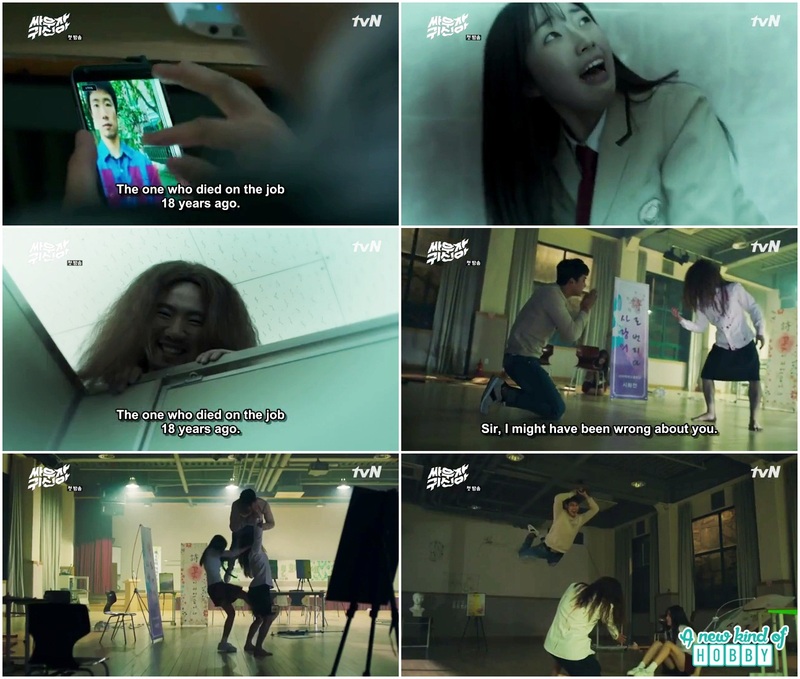 This Ghosts story remind us of Oh My Ghostess, Master Sun, Who Are You, Arang & The Magistrate and Chae Young (Ghost Seeing Detective). Those were really ment to be scary. The story let's fight ghost starts with the male lead intro who can see Ghost. The very first scene he ran to chase a ghost in the market. This means he can see ghost anytime anywhere even in the bathroom. The female ghost snuck in an and got beaten by Bong Pal. In the end she shouted "you displaced my jaw" i promise i won't come here. He had the power to beat the ghost but not the powerful ones. Bong Pal took handsome amount to exorcisim. He haunt GHost and make his living also he was in need of 100,000 dollars. Two of the friend were the owner of Ghostnet Club. This sound interestuing to us. Bong Pal also accidentally saw their video online but couldn't proceed and receive a messege "If you chase the school i will pay you 10 million won". The Ghostnet owners and Bong Pal happen to be at Seoyi Girls High School. Bong Pal encounter the female Ghost Kim Hyun Ji and was badly beaten by her. She was too strong to handle him. The fight was really interesting, it was our first time seen a Ghostess pulling hair, hitting the eyes and threw punches. This Cafe scene remind us of the drama "Oh My Ghostess". The same theme she also doesn't knew the reason of her sudden and unjust death like the female ghostess Kim Hun Ji. She had a friend who is also a Ghostess and always leech over handsome men. Th enext day Bong Pal took Monk Myung's Ghost haunting weapon. He wanted to chase the female ghost and took revenge to what she did to hi face. But again she threw punches and kicked him. They both fell from stairs rolling down and end up with a kiss. Both of them including us didn't expect the kiss in the first episode and it was unbeliveable how can ahuman kiss a ghostess. Also the Ghostess feels it, because it was her first kiss. She also remember some moments when she was dying bleeding on the road. Bong Pal said it wasn't intentionally and also teased her not knowing the furious Ghostess will going hit him again. The two funny guys of Ghostnet were all set to capture Ghosts. They install cameras in the hallway and hide in the toilet with another camera waiting for the ghost to appear. They took a nap and Chun-Sang feels something cold near his neck and when he saw it was the scary Ghost. Both the friends including us screamed and got scared at the same time. Seriously the darkness and the appearance of the Ghost was too scary. The school was haunted by bad spirits. Both of them run hitting their back packs on the ground chased by the scary ghost meets Bong Pal. He along with them run towards the lift but that scary ghost caught Bong Pal's neck and the lift door open again. But Bong pal with all his strength smack the ghost using his fist. The scary female ghost turned into a male ghost OMG he has too much bad energy and dual face. Now Bong Pal fears about the female Ghostess who was peeking behind the hallway. The scary Ghost saw that Ghostess and turn towards her. The Ghostnet guys find out that Ghost was the english teacher who died 18 years ago. The other said he wasn't a teacher he was a pervert that's why we come to knew the reason of the scary ghost dual personality. Listening their conversation Bong Pal feel something might bad happen to the female Ghostess run to help her. He had a fight with the scary Pervert Ghost but couldn't manage to stand and hit him. The more scary he seems the more powerful he was. The female Ghostess help Bong Pal and shouts hit this side she had a power to see the weak points of the ghost. This help them to get rid of that perverted ghost. The female Ghost realize Bong Pal is the one who can help her knew the reason for her unjust death so she find Bong address and ask him to help her just once she need to do. Infact she was trying to touch and feel Bong Pal to remember something from the past incident. She flew towards Bong Pal we were amazed. Will it be there second kiss but it leaves the curiosity what will happened will be reveal in the second episode.